I started my summer holiday with a trip to Cumbria in the North-East of England. Woolfest 2013 is one of the big events on the knitting calendar and, as I usually work events rather than attend, being able to go as a visitor felt like a treat. Of course, my Woolfest visit turned into actual work once I got there - places to be and people to see - but it was good to be a 'punter' for about 20 minutes! Compared to other events I've either attended or worked, Woolfest was overwhelming. It wasn't as crowded as I had feared, but I found myself rushing from one end to another over and over. And then it was suddenly time to go home and I hadn't done half the things I had planned on doing. Woolfest is all about celebrating British wool/yarn and I loved seeing the rare sheep breeds on display. I wasn't too happy with people who kept poking the poor sheep, but it was great seeing the animals in person. I think many knitters forget that there is an actual animal at the end of their yarn (so to speak) and I think even more knitters do not realise the variety of local wool available. I was very taken with the Wesleydales (hippies, man) but I loved the Manx Loaghtan sheep even more. When I saw the white Wesleydale/Manx mix, I could not resist. Coupled with the darker Manx, this will become a warm winter's hat. One of my favourite destinations at any knitting event is always the Susan Crawford Vintage stall. This time I wanted to see Susan's new cotton yarn - Coquette 4ply - but it is always a joy to look at her stall. She has such a personal sense of colour and a very focused aesthetic. 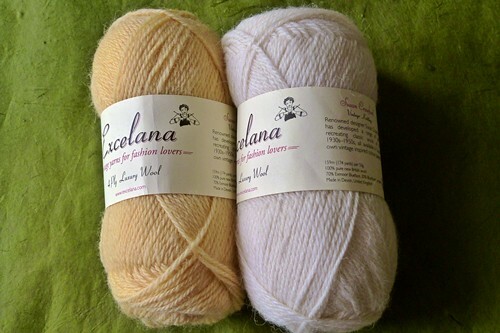 I didn't leave with any Coquette, but I picked up two balls of the exquisite Excelana 4ply. It feels beautiful in the ball and I want to support British yarn producers! I have a very specific design idea for this yarn. Shhh. This was an unexpected purchase. 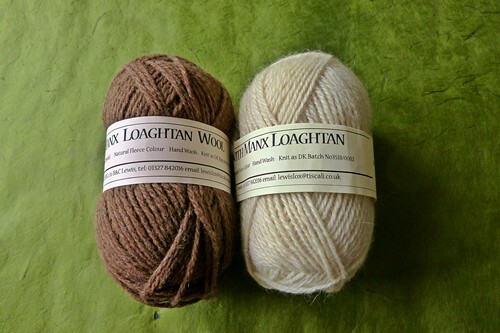 This was described as "Hebridean 4ply" and it certainly looks like Hebridean 4ply. 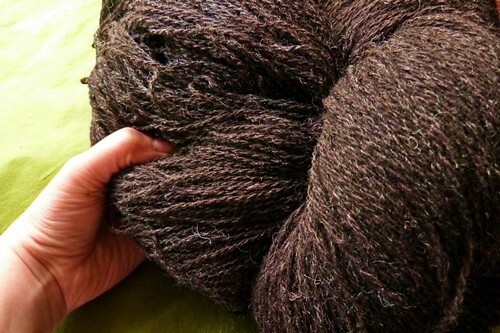 As you can see by my tiny hand, this is a massive amount of dark brown 4ply with a decidedly Hebridean feel. Goodness knows how much is there, but it will certainly be enough to form the backdrop/main colour of a colourwork cardigan. I am ridiculously pleased with this purchase and it was a real 'spur of the moment' one too. And then I bought buttons. I woke up Sunday morning when the whiff of the button stalls had cleared from my head and I was confused for a moment. Had I really bought that many buttons? Of course I had. I always buy buttons at events. The big two buttons are ear-marked for a project. The buttons at (roughly) 4 o'clock are meant for my Bute cardigan (1.5 sleeves to go! 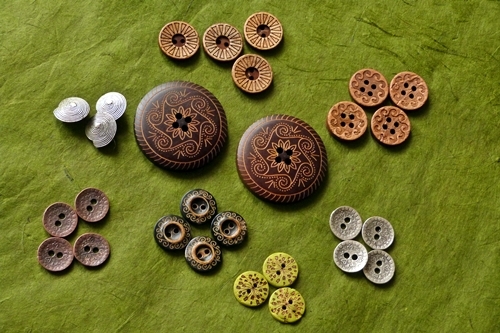 ), the 8 o'clock buttons are for the Stevie cardigan and I bought the 9 o'clock buttons because they reminded me of ammonites. We like fossils in Casa Bookish! The rest of the buttons were bought for unspecified future projects. It was very good to meet a lot of friends - both old and new. Apologies if I missed seeing you or if I was only there for a second - it was a manic day. I think if I am to do Woolfest again, I will have to stay overnight. One day isn't really enough! And on that note I think I shall go enjoy the rest of my holiday.